Some rebel groups abuse noncombatant populations, while others exhibit restraint. Insurgent leaders in some countries transform local structures of government, while others simply extract resources for their own benefit. In some contexts, groups kill their victims selectively, while in other environments violence appears indiscriminate, even random. This book presents a theory that accounts for the different strategies pursued by rebel groups in civil war, explaining why patterns of insurgent violence vary so much across conflicts. It does so by examining the membership, structure, and behavior of four insurgent movements in Uganda, Mozambique, and Peru. Drawing on interviews with nearly two hundred combatants and civilians who experienced violence firsthand, it shows that rebels' strategies depend in important ways on how difficult it is to launch a rebellion. The book thus demonstrates how characteristics of the environment in which rebellions emerge constrain rebel organization and shape the patterns of violence that civilians experience. 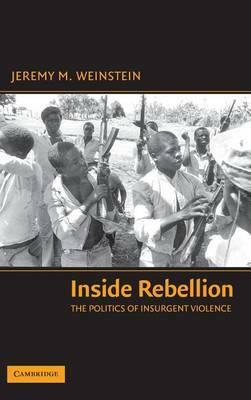 Buy Inside Rebellion by Jeremy M. Weinstein from Australia's Online Independent Bookstore, Boomerang Books. Jeremy M. Weinstein is an assistant professor in the Department of Political Science at Stanford University. His research focuses on civil war, ethnic politics, and the political economy of development in Africa. He has published several articles in academic and policy journals, and he has received grants and fellowships from the Russell Sage Foundation, the Harry Frank Guggenheim Foundation, the Center for Global Development, the Brookings Institution, the Woodrow Wilson International Center for Scholars, the World Bank, and the US Department of Education.